This is my second cost of delay post, you may want to read Unquantified cost of delay in prioritization first. How to recognize an artificial deadline using cost of delay? Business world is full of deadlines. Sometimes they cause unnecessary stress for the employees and for the organization, sometimes they contain a really important message how something cannot be late. So how to know when a deadline is reasonable and when it is artificial? 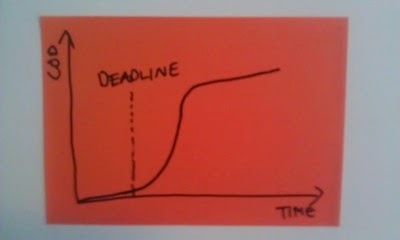 If the form of the cost of delay curve does not change near the deadline, the deadline is artificial. In this case the deadline is reasonable. If the company misses it, I will lose a big amount of money. In this case the deadline is questionable. Yes, in the future the company may lose a big amount of money but why is the deadline so early? 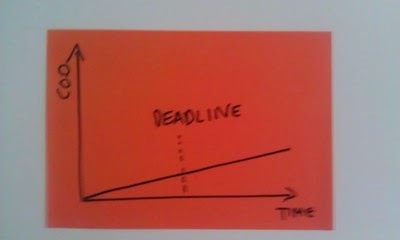 If the deadline is met, the ready product/feature/etc is waiting in an inventory for a long time. Another possible problem is that the solution is implemented without using the latest available information. 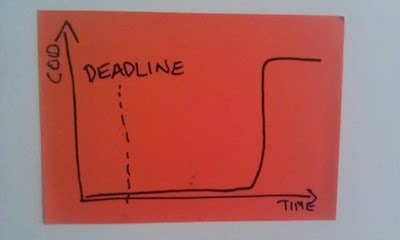 This means that in the worst case the solution can be outdated when the real deadline hits. In this case the deadline is artificial. You can ask why that particular date was selected? Why not week later or week earlier? 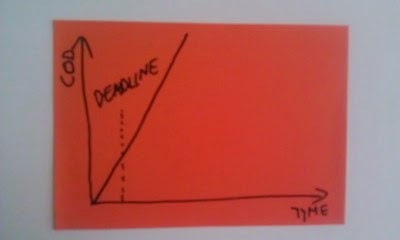 It is hard to see the reasoning for this deadline. If there are no bigger cost of delay items waiting to be done, this should be just done as soon as possible. If there are, this task is a wrong one to do. Also in this case the deadline is artificial. Yes, the company is losing money all the time but why not just focus on fixing the problem as soon as possible? What to do with an artificial deadline? If I hear a deadline that seems to be artificial, I always ask how the date was decided? It may well be that I'm missing some important information that I didn't know earlier. In that case the deadline isn't artificial and I just learned something relevant. On the other hand if it appears that the date was "just selected", it gives me an opportunity to have a discussion about the concept of cost of delay. If you can figure out a situation where the cost of delay curve does not change format but deadline still makes sense, I would be interested to hear.